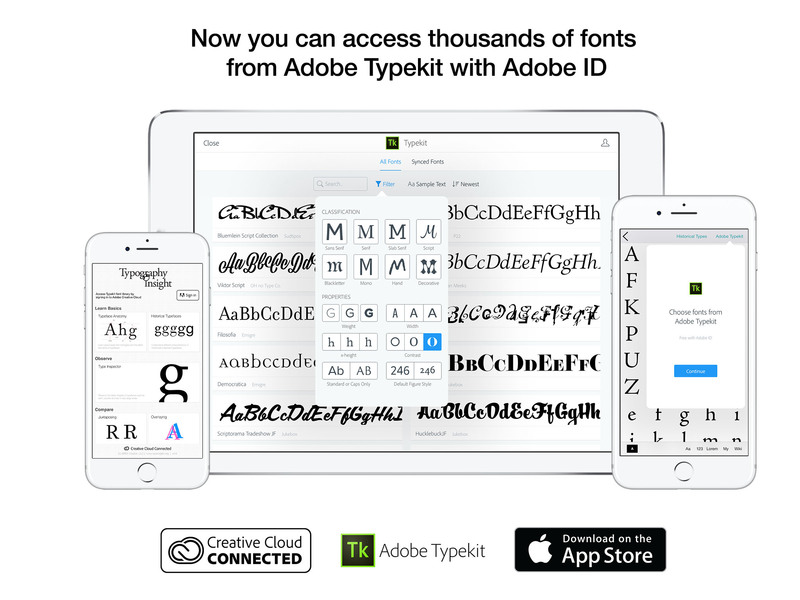 I am excited to announce that Typography Insight for iPad/iPhone now supports Adobe Typekit®. Thanks to Adobe Creative SDK, you can access thousands of fonts from Adobe Typekit by signing in with Adobe ID. Can’t wait to see how design students, educators, and professionals start leveraging Typekit’s rich library for learning, teaching and researching types. The update is available on iOS App Store now. Typography Insight is a toolkit for experiencing, learning & teaching typography. It was published on iOS about five years ago and embraced by the design and education communities. Last year, I brought this app to Windows and HoloLens. Typography Insight is composed of multiple tools. Below are the snippets of each component. You can compare two different typefaces in synchronized scale and pan movement. This allows you easily observe and compare the subtle detail shapes and elements of typefaces. You can compare two typefaces by overlaying on top of each other. Observe the detail shapes of types through different types of sample text such as glyph view and paragraph view. Learn about basic terminologies and the detail elements of typefaces. Understand different characteristics of historically important typefaces. Learn about type size measurement and the units. Train your eyes for the balanced letter space. Check out this article for more information on how HoloLens and mixed reality is changing the way we interact with types in space.